The action-packed shadow play -- featuring eight actor-technicians, 160 puppets, costumes, masks, scenography, digital animation and a cinema-size screen -- will take the Waterman Theatre stage at 7:30 p.m. Jan. 23. An earlier production that day has been scheduled for several grades' worth of students in the Oswego City School District. "The content of this production is both historically and culturally important and timely," said Miranda Traudt, director of Artswego, SUNY Oswego's arts presentation organization. "I am especially excited to have the opportunity to share this experience with young audiences from our local elementary schools." Hamid Rahmanian's play recounts a tale in the 10th century Persian epic "Shahnameh," translated as "The Book of Kings": Star-crossed lovers -- the outcast Zaul and the princess Rudabeh, brought to life thanks to the shadow-casting technique of Larry Reed -- triumph against all odds. "The innovative use of live animation and shadow casting coupled with costumes, puppets and multimedia projections creates a truly unique and immersive experience," Traudt said. "It will be unlike anything we've presented before." Audiences from Los Angeles to New York City have been treated to the same show that is coming to Oswego. Famed director Francis Ford Coppola reportedly saw "Feathers of Fire" three times, hailing it as, "Fantastic! 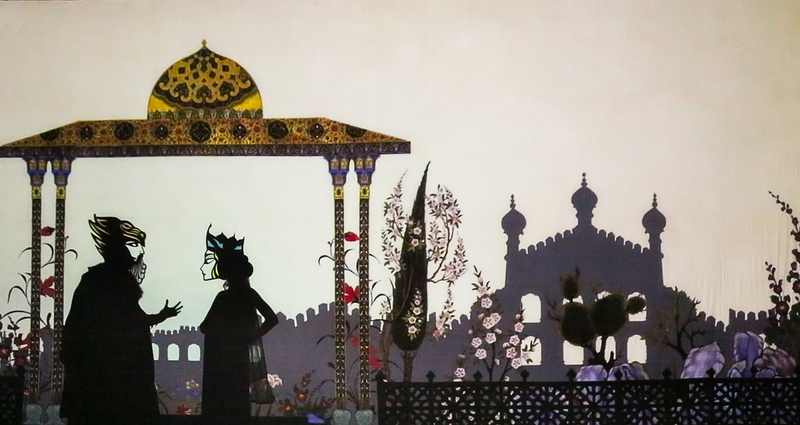 One of the greatest epics of all time and my favorite 'Shahnameh' brought to life in a spectacular fashion by Hamid Rahmanian with shadow puppets design and cinematic wizardry." Other reviewers have been equally impressed. "Perfection! Keeps you spellbound and holding your breath … you could have heard a pin drop," wrote the Santa Monica Daily Press. With music by Iranian American musicians Loga Ramin Torkian and Azam Ali, "Feathers of Fire" helps Rahmanian convey the cultural richness of a Middle Eastern country often in the news for negative, political reasons. Los Angeles Times reporter Tim Greiving wrote, "Seeing cross-cultural and cross-generational audiences at performances of 'Feathers of Fire' fulfills Rahmanian's deepest dream: to share his homeland’s rich visual and literary culture with the West." A New York-based Iranian filmmaker, graphic artist and 2014 Guggenheim Fellow, Rahmanian plans to introduce the play and appear for questions and answers afterward, Traudt said. The director-designer also intends to sign copies of his lavish, multidimensional pop-up book -- artwork from the book has been exhibited and purchased by several museums -- as part of an appearance at River's End Book Store in Oswego at 6 p.m. Monday, Jan. 22, and to appear in SUNY Oswego classes in music and in cinema and screen studies Jan. 23. Tickets for "Feathers of Fire: A Persian Epic" are $20 ($5 for students) and are available online at tickets.oswego.edu, at the Marano Campus Center box office prior to athletic events (for winter break hours, visit oswego.edu/tickets) or by calling 315-312-3073. Parking for the 7:30 p.m. performance is included in the price of a ticket and is available in the employee and commuter lots in front of Culkin Hall and behind Hart and Funnelle residence halls. People with disabilities needing assistance to attend should contact the box office in advance at 315-312-3073. 'Immersive experience' -- Using modern technical wizardry and a variety of cinematic tools, Iranian filmmaker and graphic designer Hamid Rahmanian's elaborate shadow play, "Feathers of Fire: A Persian Epic," aims to delight audiences of all ages Tuesday, Jan. 23, at SUNY Oswego's Waterman Theatre.